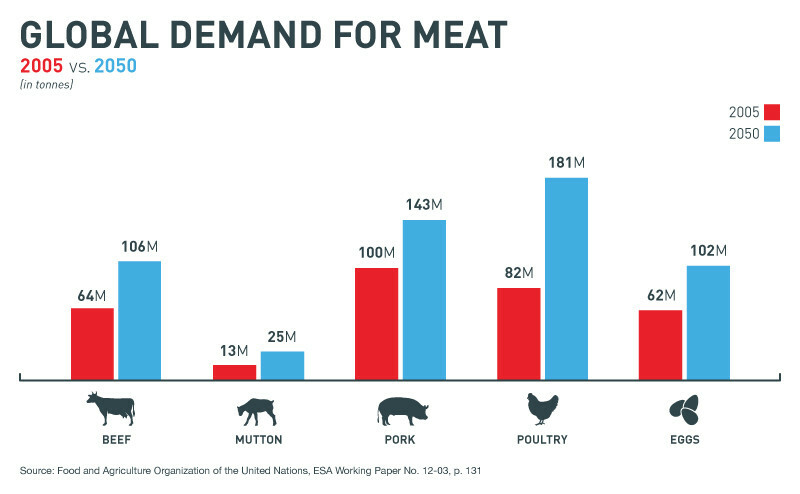 As the global population swells towards 10 billion and increasingly affluent emerging markets demand more meat in their diet, feeding the world is going to be both an enormous challenge and a historic economic opportunity. Currently, the world relies heavily on intensively-farmed livestock for much of its protein – around 99% of all meat in the US for example comes from factory farms. However, a report released this week on the future of food explains the business case driving the market away from animal proteins and towards greater use of plant-based sources of protein. The analysis is backed by a $1.25 trillion coalition of institutional investors, including the likes of Robeco, Aviva Investors and Nordea who are urging some of the world’s largest multinational food companies to set strategies to diversify into new foods that can provide an alternative to meat. Of course, large food firms already offer a variety of meat and dairy alternatives bought by vegetarians or vegans, but this approach argues that a more sophisticated strategy is needed to address this issue, including a new generation of investment in food tech start-ups to entice people who love meat and dairy products to alter their diets. The investors highlight three trends set to reshape the way we eat in the coming years. The first is the livestock sector’s unsustainable impact on the environment. The sector is a disproportionate user of land and water, and is responsible for more greenhouse gas emissions than the transport sector. It is also a major contributor to deforestation due to the soya required to produce animal feed – over 90% of Amazon deforestation has been attributed to the livestock sector. As the world transitions to a low-carbon economy, intensive farming is becoming a high-risk sector for investors. Secondly, the analysis highlights a shift in consumer eating habits, especially in developed markets, towards diets that contain less meat. For example, 25% of US consumers decreased meat intake in 2014 and ‘alternative meat’ sales – which includes products like Quorn – grew by 57% in the four years to 2015. High-street brands such as Pret a Manger and Starbucks are also beginning to see demand for non-meat options. Starbucks received nearly 96,000 requests to add almond as a non-dairy option on its menu, while around 10,000 customers contacted Pret a Manger to confirm demand when the UK high street retailer floated the idea of an all plant-based store in London’s Soho earlier this year. According to research featured in the report, the plant-based protein market is set to grow 8.4% annually over the next five years. Thirdly, and perhaps most significantly, is a new tendency among regulators to encourage citizens to eat less meat. For example, Denmark is considering proposals to introduce a tax on red meat in order to fight climate change, and China has issued guidance via its health agency to urge its citizens to reduce meat consumption by 50%. Could we one day ‘grow’ meat in our kitchens? As intensively-farmed livestock reaches the limits of its ability to meet global demand for protein, far sighted investors can see opportunity for a food tech revolution. This includes the growth of exciting companies able to replicate the taste, texture and nutrition of meat but using more sustainable plant-based alternatives. One example of this emerging sector includes California-based Impossible Foods, whose biotechnology expertise enables them to use the heme molecule to make their vegetarian burger taste like meat. Other meat-based products being replicated without animals include egg whites (by Clara Foods), milk (by Perfect Day) and gelatine (by Gelzen). Some large multinationals - such as General Mills, which holds its AGM in Minneapolis this week - are already ahead of the game. For example, General Mills has set up ‘301 Inc’ - a vehicle to look at emerging food brands that can capitalise on these trends and help create a more sustainable ‘protein supply chain’. One of their investments, ‘Beyond Meat’, has now been successful in getting their plant-based ‘meat’ burgers on the meat aisle of in retailers such as WholeFoods, Publix and Safeway. This is a good start but more needs to be done and General Mills remains in a small minority among food giants taking action in this area. That is why the $1.25 trillion investor coalition has launched an engagement with 16 food companies including Kraft Heinz, Nestle, Unilever, Tesco and Walmart asking them to disclose their plans for managing the risks and capitalising on the opportunities as global protein demand shifts. Protein is essential to good health, indeed the origin of the word is the Greek word protos, meaning ‘first’ –reflecting protein’s top-tier status in human nutrition. Major food companies need to place more emphasis on the future of protein if they are to respond to the shifting nature of how we consume it and the window of investment opportunity this presents.